Are you looking for Agra city travel guide? Do you want to know what to see and do on your Agra city tour in India? If yes then we can provide you comprehensive information about Agra Tourism and sightseeing opportunities available within and around the city. Agra, a city in Indian state of Uttar Pradesh, needs no introduction as it is home to world famous monuments and world heritage sites like Taj Mahal, Agra Fort, Fatehpur Sikri, Itimad-Ud-Daulah Tomb, and Sikandra Akbar’s Tomb. Exploring the city of Agra and around will remind you prosperous era of Mughal empire. As the home of the beautiful monument Taj Mahal, Agra is internationally famous. Millions of tourists from different parts of the world visit Agra to the Taj Mahal and several other historical monuments. Located on the banks of the River Yamuna in the northern Indian state of Uttar Pradesh, Agra has become a worldwide famous tourist destination in India. They are predominantly famous for three Mughal monuments and UNESCO World Heritage Sites namely Taj Mahal, Agra Fort and Fatehpur Sikri. Agra is also one of the three destinations covered by Golden triangle tour in India. Two other destinations covered by golden triangle trip are Delhi and Jaipur. 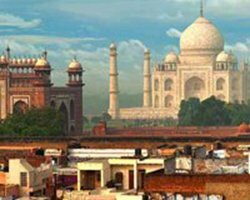 Whether you are completely on Agra tour or the golden triangle tour, you will have a great tourism experience and a golden opportunity to see some of the finest and beautiful heritage monuments of India. Agra city provides a wonderful tourism opportunity to tourists coming from the different part of the world as there are numerous attractions within and around the city. If you have already visited Agra’s prime attractions like Taj Mahal, Agra Fort and Fatehpur Sikri then again the city offers you several others to be visited and explored. You can see several other historical monuments and places of interest within and around the city. Akbar’s Tomb, Mariam-Uz-Zamani Tomb, Itimad-Ud-Daulah Tomb, Dayal Bagh, Jama Masjid, Chini Ka Rauza, Ram Bagh, Mehtab Bagh, Mughal Heritage Walk, Mankameshwar Temple, Gurudwara Guru ka Taal, and Paliwal Park (Hewitt Park) are some other attractions in and around the city of Agra which will entice you and provide you a great tourism experience to cherish for lifetime. Apart from sightseeing in Agra, the city also offer a great shopping experience. It is shoppers’ paradise. Here you can indulge in shopping activities and can buy handicrafts, leather items, and other souvenirs for you, your relatives and friends. The city of Agra is easily accessible by Air, Road and Train. It is a well-connected city. By Air: Agra is well-connected by domestic flights. Air India flies to Agra on the route: Delhi - Varanasi - Agra - Khajuraho - Varanasi - Delhi. Taj International Airport is a new greenfield international airport proposed for Agra with aim to boost tourism in Agra and Uttar Pradesh. By Train: The city of Agra is well-connected by a network by Indian Railways from the different cities of India. Agra Cantonment Railway Station, Agra Fort Railway Station, Agra City Railway Station, Raja ki Mandi Railway Station, Idgah Railway Station, and Yamuna Bridge Railway Station are major railway stations in the city of Agra that connects the city to different other cities and towns of India. By Road: The city of Agra is easily accessible from Delhi, Noida, Ghaziabad, Jaipur, Udaipur, Jodhpur, Rishikesh, Haridwar, and some other cities of Northern India. Taj Depot, ISBT, Idgah Bus Stand, and Fort Depot are the major bus stations in Agra city, connecting to the most major cities and towns of northern India.